Franja Partisan Hospital is part of the Tentative list of Slovenia in order to qualify for inclusion in the World Heritage List. 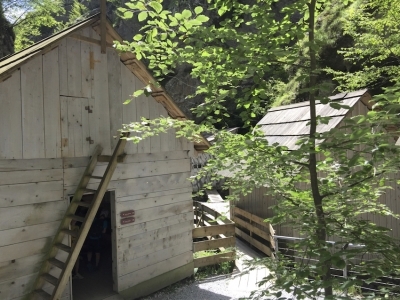 The Franja Partisan Hospital is a small simple clandestine field hospital located in the narrow, barely accessible Pasica gorge. The hospital complex is composed of 14 wooden buildings and several small auxiliary facilities. It was gradually set up in the period from December 1943 to May 1945 by the Slovenian resistance with the help of local inhabitants. It included an operating room, X-ray apparatus, an invalid care facility, and a small electric plant. Most of the buildings have been wiped out by a disastrous flood in 2007. It was reconstructed using original elements whenever possible. The hospital had a capacity of up to 120 patients, and provided treatment to a total of 522 severely wounded persons of various nationalities (Slovenes and citizens of Yugoslav nations, Italians, French, Russian, Poles, Americans and an Austrian). One of the patients, a captured German soldier, joined the hospital staff after his recovery and remained there until the end of the war. Conspiracy and security were of crucial importance to all clandestine partisan hospitals. The only access was a path with footbridges and drawbridges hidden in the steep Pasica gorge. The wounded were blindfolded and carried to the hospital by staff, most often at night. There is now a wooden path leading to the facilities, and it is easy to imagine how difficult it must have been back then to go up carrying wounded patients. The path was defended by machine-gun nests still visible today. The hospital was never discovered, and after the war, it became a symbol of the partisan movement. I visited this site in June 2018. It is well sign-posted (though only in Slovenian : Partizanska Bolinca Franja), about an hour drive from Ljubljana, passing very nice slovenian hillsides and valleys. There is an entrance fee of 5 euros. The site is very interesting to visit, with explanations given to every buildings, and you can even consult a registrary of all the patients having been treated here. I found it to be a very emotional and educational visit and a strong symbol of humanity during an horrific war. ICOMOS would probably note lack of authenticity, as it has been destroyed in 2007 and is now heavily restored. But at a time of polemics about inscription of site related to war (ie 2018 postponment of Western Front Memorials of WWWI), this site would convey a message of humanity, nobleness and comradeship transcending horrors of the war. The Franja Partisan Hospital could have become such a good addition to the WH List. It's a unique reminder of the Slovenian resistant movement during World War II. In remote, mountaineous locations they constructed small hospitals to care for the wounded Partisans and Allied forces. These were clandestine operations, and their locations were kept top secret. Injured soldiers were blindfolded before being transported to these sites. Unfortunately, disaster struck on 18 September 2007. The hospital was hit by a devastating flood. It swept away all barracks except for one, and the original furniture and hospital instruments went with it. Since then, the hospital has been rebuilt and it opened again to visitors in 2010. What you see now are replicas of everything. Making good use of my rental car I visited the Franja Partisan Hospital on a sunny Saturday morning. It lies close to the hamlet Dolenji Novaki, but is not signposted from there. Fortunately I came across a large sign later on from the main road towards the town of Cerkno. Nowadays the former hospital still lies in a remote location. There's a small car park and a café downstairs, but from there you have to hike uphill for 10 minutes on a forest and mountain trail. Along the route there are information panels in Slovenian and English. Also you can still see the remains of a watchpost, half-hidden among the rocks. The canyon that gives access to the hospital was heavily guarded during the war . You wonder how many visitors come here every day, but there is a real ticket counter set up. Access costs 4 EUR . For that you can enter the 14 barracks. In each of the wooden buildings explanation is given what it was: a ward, operating theatre or kitchen for example. The staff also lived on the property. The hospital was well cared for, there was ample food smuggled in and they even had an x-ray machine. That machine also fell victim to the 2007 flooding. What you see now are reproductions or similar devices / objects from elsewhere. This lack of authenticity will greatly reduce the chances of a future world heritage status, I suspect. What remains is a 'lieux de memoire'. To me it was a very interesting visit, and it's certainly worth a detour if you're driving around in Slovenia.